Are Emperor Penguins Marching to Extinction? Emperor penguins, which delighted audiences of the Academy Award-winning documentary March of the Penguins, could be sliding on the path toward extinction—the victims of climate change. The key threat to the penguins is diminishing sea ice, an essential platform on which the tall, tuxedoed birds breed, feed, and molt. The ice also serves as a grazing ground for krill, tiny crustaceans that thrive on algae growing on the underside of the ice. Krill, in turn, provide food for fish, seals, whales, and penguins. Stephanie Jenouvrier and Hal Caswell, biologists at Woods Hole Oceanographic Institution, developed mathematical models that project the penguins’ population growth and decline based on observations of the birds’ mating, breeding, and feeding behaviors and birth and mortality rates. The models used data collected over 43 years by French scientists studying the large emperor penguin colony in Terre Adelie, Antarctica. Jenouvrier and Caswell coupled their population dynamics models with projections of Antarctic climate change and resulting loss of sea ice—working with scientists from the National Center for Atmospheric Research and the National Snow and Ice Data Center and from Expeditions Polaires Francaises and Institut Paul Emile Victor in France. Their results predicted what would happen to the penguin population under various climate scenarios. The study, published Jan. 26, 2009, in Proceedings of the National Academy of Sciences, showed that if climate change continues to melt sea ice at the rates published in the latest Intergovernmental Panel on Climate Change reports, the median population size of the Terre Adelie penguin colony likely would shrink from its present size of 3,000 to only 400 breeding pairs by the end of the century. What’s more, the researchers calculated a 40 to 80 percent probability that the population would drastically decline (by 95 percent or more) and threaten it with extinction. In the 1970s, reduced sea ice conditions led to a 50-percent population decline in the Terre Adelie population. 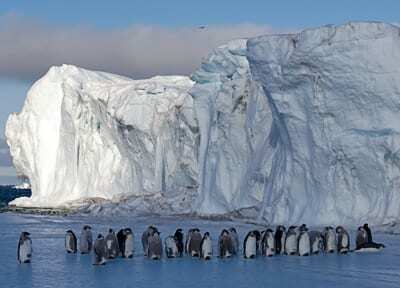 But how sea ice changes affect the penguins is complex and still not fully understood. 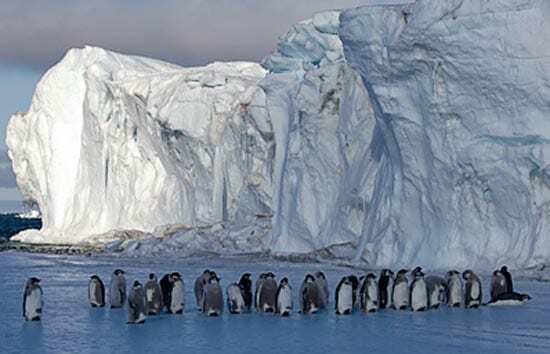 Nor is it known how climate changes would affect other emperor penguin populations throughout Antarctica, Caswell said. The research was supported by the UNESCO/L’OREAL Women in Science program and the National Science Foundation. Get ready to send the biology textbooks back to the printer. In a new study, Benjamin Van Mooy, a geochemist at Woods Hole Oceanographic Institution (WHOI), reported that microscopic plants growing in the Sargasso Sea have come up with a completely unexpected way of building their cell membranes. Until now, scientists thought that all membranes surrounding cells contain molecules called phospholipids—oily compounds that contain phosphorus and other biochemical nutrients including nitrogen. However, Van Mooy and colleagues found phytoplankton in the Sargasso Sea that make their cell membranes without phospholipids—substituting instead lipids that don’t contain phosphorus. These “substitute lipids” once were regarded as merely a molecular peculiarity of phytoplankton grown in the laboratory, but now scientists recognize that phytoplankton throughout the world’s oceans use these lipids. Substitute lipids “are the most abundant membrane molecules in the sea, and they were essentially unknown until now,” said Van Mooy. The finding, published March 5, 2009, in the journal Nature, could help rewrite the fundamentals of cell biochemistry. The Sargasso Sea is in the middle of the Atlantic Ocean—an area where phosphorus and nitrogen are as scarce as water in the desert. A molecule of phosphorus dissolved in the Sargasso Sea remains there for perhaps an hour or two before a phosphorus-starved cell greedily absorbs it. For comparison, phosphorous in the Pacific Ocean may linger for nearly a year before plankton use it. Nevertheless, small photosynthetic bacteria called cyanobacteria flourish in the Sargasso Sea They do it by building a membrane lipid called SQDG, a molecule based on sulfur rather than phosphorus. 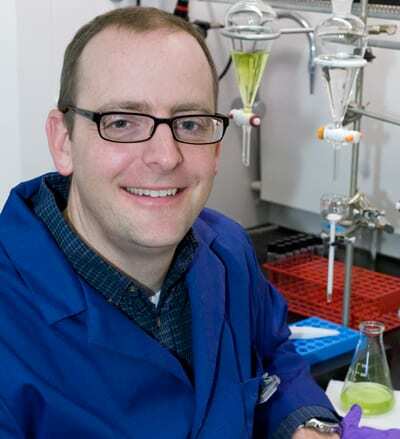 “Cyanobacteria can make membranes that require essentially no nutrients, no phosphorus, and no nitrogen,” Van Mooy explained. These betaine molecules have structures that resemble amino acids, the building blocks of proteins, and contain nitrogen. Unlike the cyanobacterial SQDG, the more structurally sophisticated plants have dodged the phosphorus requirement, but they still have to have nitrogen. Van Mooy thinks he’s on to something fundamental about the ways that phytoplankton survive in the ocean. Van Mooy’s research was supported by the National Science Foundation, the Office of Naval Research, and the WHOI Ocean Life Institute. Coral reefs around the world are in serious trouble from pollution, overfishing, climate change and more. The last thing they need is an infection. But that’s exactly what yellow band disease (YBD) is—a bacterial infection that sickens coral colonies. Researchers at the Woods Hole Oceanographic Institution (WHOI) and colleagues have identified the bacteria responsible for the disease and say that YBD seems to be getting worse with global warming. Just as a doctor can diagnose chicken pox by the small, round bumps on skin, scientists can spot the characteristic markings of YBD. The affliction etches a swath of pale-yellow or white lesions along the surface of an infected coral colony. The discolored band is a mark of death. It indicates where the bacterial infection has killed the corals’ photosynthetic symbionts, called zooxanthellae, which provide their major source of energy. The coral host suffers from cellular damage, starves, and usually does not recover. In the November 2008 issue of the Journal of Applied Microbiology, lead author James Cervino, a guest investigator in the WHOI Marine Chemistry and Geochemistry Department, and colleagues reported that they isolated the microbes that cause YBD: a group of four new species of Vibrio, which combine with existing Vibrio on the coral to attack the zooxanthellae. This is the first demonstration that the same microbial culprits are to blame for the disease throughout the Caribbean, as well as halfway around the world in Indonesia, Thailand, and the Philippines. pathogen that causes cholera in people, but there is no known danger to humans from YBD. Cervino and colleagues grew Vibrio pathogens together with healthy coral. “Contrary to what many experts have assumed, this disease occurs independently of warming temperatures,” he said. But when water temperatures go up, infections do become more lethal. “Thermal stress and pathogenic stress are a double-whammy for the organism,” he said. With ocean temperatures on the rise and the Vibrio pathogens living in tropical oceans throughout the glob, the prognosis for the spread of YBD is rather grim, he said. Cervino, a professor at Pace University in New York, is a visiting scientist at WHOI, working with WHOI geochemist Konrad Hughen. “You have biology and chemistry merging together in this lab at WHOI, and it’s turning out to be an amazing collaboration,” Cervino said.